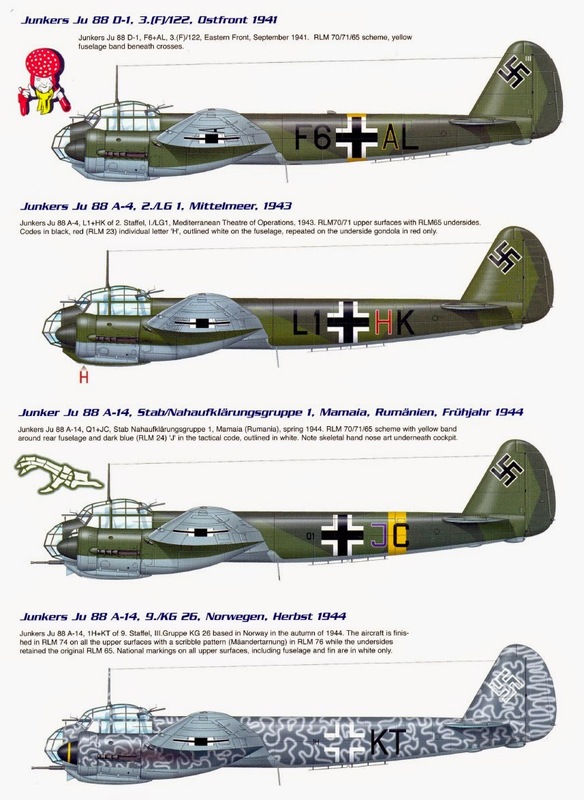 The Ju 88 was the most numerous and versatile German bomber of World War II. It was grafted to every conceivable purpose, and even served as the lower half of a primitive guide missile! In 1935 the German Air Ministry announced specifications for a new, twin-engine Schnellbomber (fast bomber). One year later Junkers beat out two other contenders with the Ju 88, a highly streamlined, smoothed-skinned airplane with mid-mounted wings. A crew of four sat under a large glazed canopy while a bombardier gondola, offset to the left, ran back from the nose. Test results were excellent, but Luftwaffe priorities were skewed to other craft, and production remained slow. By the time World War II erupted in September 1939, only about 50 Ju 88s had reached Luftwaffe units. 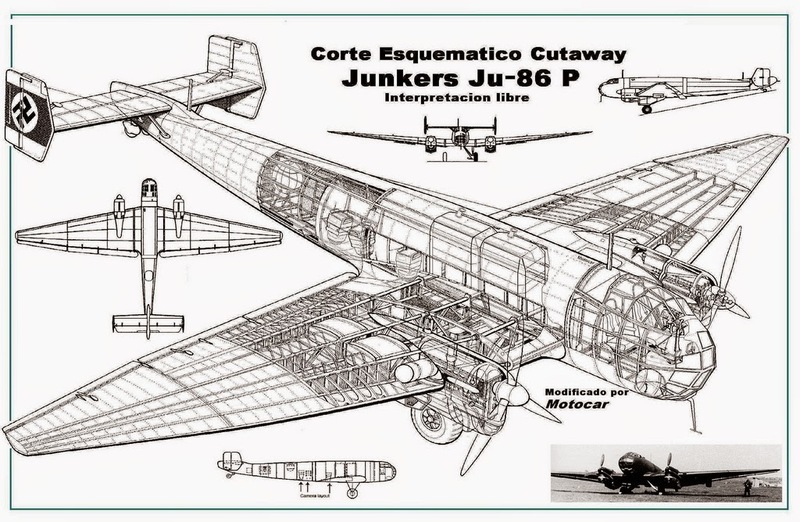 In combat the Junkers design was fast, carried a good bomb load, and could absorb great amounts of damage. Moreover, although originally intended as a bomber, it could be adapted to virtually every mission assigned to it: mine-laying, night-time fighting, reconnaissance, anti-ship patrols, heavy fighter, ground attack, and dive-bombing. 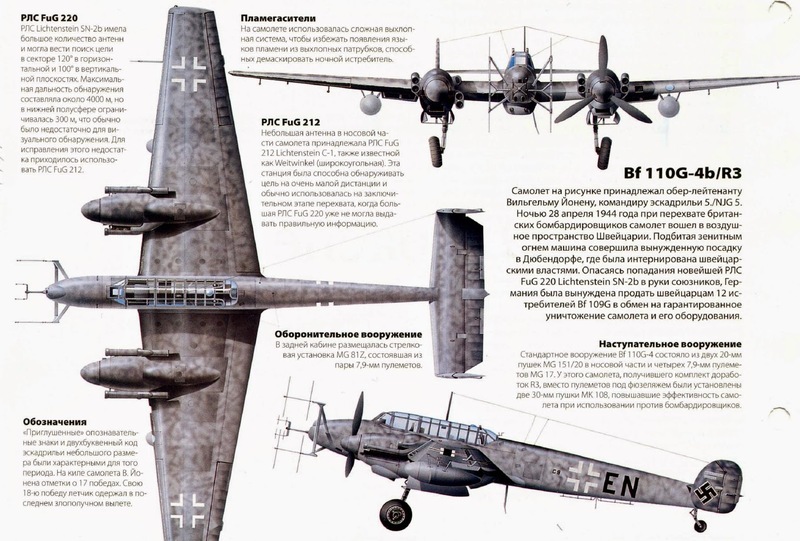 Ju 88s accordingly distinguished themselves in combat from England to Russia, Norway to North Africa. 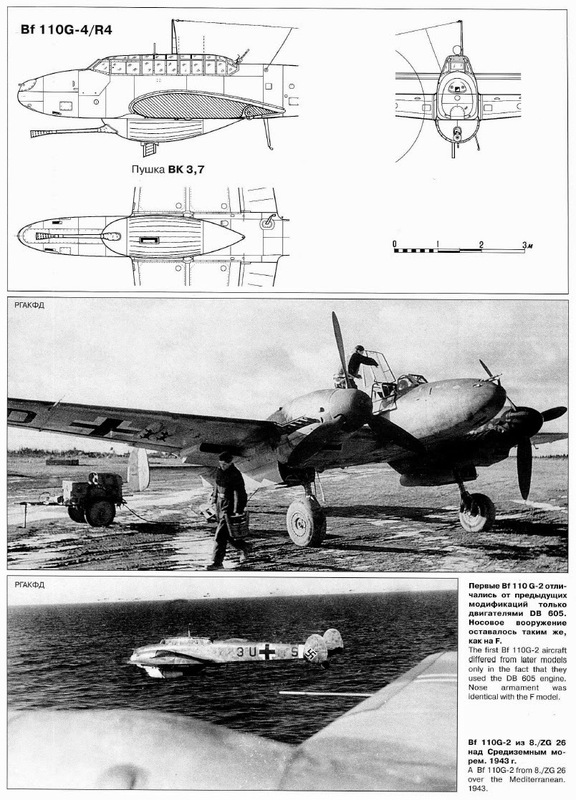 The prototype Ju 88 flew on 21 December 1936 with two 1,000-hp (746-kW) Daimler-Benz DB 600Ae inline engines with annular radiators, giving them the appearance of radials; the use of these radiators was to continue throughout the development of the aircraft. Further prototypes followed, the third having 1000-hp (746-kW) Junkers Jumo engines and this, during evaluation, reached 323 mph (520 km/h). The high performance of the Ju 88 encouraged record-breaking flights, and in March 1939 the fifth prototype set a 1,000-km (621-mile) closed-circuit record of 321.25 mph (517 km/h) carrying a 4,409-lb (2000-kg) payload. A total of 10 prototypes were completed and the first of the pre-production batch of Ju 88A-D bombers flew in early 1939. Production aircraft were designated Ju 88A-1 and began to enter service in September 1939. Early teething troubles were gradually ironed out and sub-variants began to appear, including the Ju 88A-2 with jettisonable rocket packs for assisting takeoff in overload conditions, the Ju 88A-3 dual-control trainer and the Ju 88A-4, the first considerably modified development. Designed around the new and more powerful Jumo 211J engine, the Ju 88A-4 had increased span and was strengthened to take greater loads. 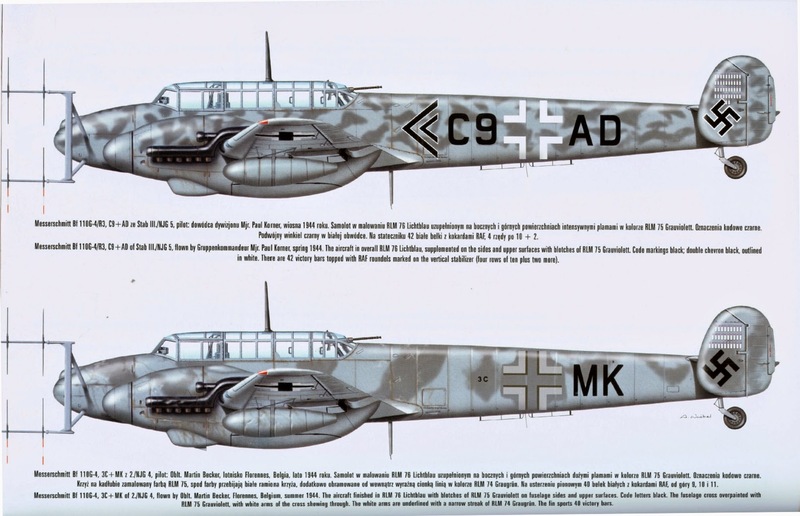 Because of problems with the new engine the Ju 88A-4 was overtaken by the Ju 88A-5, which featured the new wing but retained the former engines. 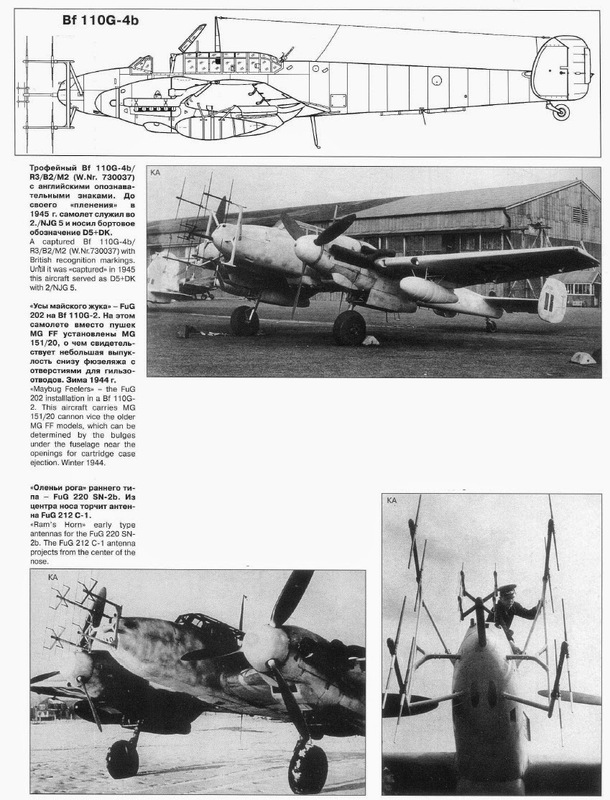 During the Battle of Britain many Ju 88A-5s were fitted with balloon-cable fenders and cutters to combat the UK's balloon barrage, and in this form they became Ju 88A-B aircraft. Some Ju 88A-5s, converted to dual-control trainers, were designated Ju 88A-7. 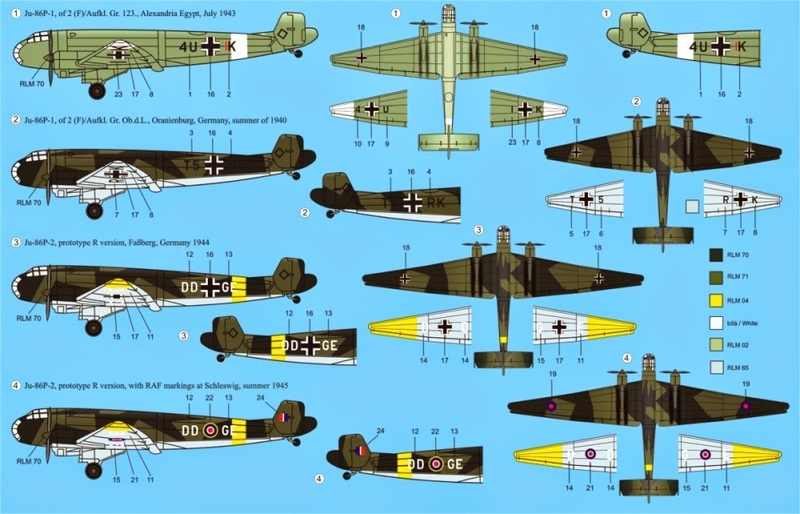 By the time definitive Ju 88A-4s began to enter service, lessons learned in the Battle of Britain had dictated heavier armament and better protection for the crew. Several different armament layouts were used, but a typical installation was a single 7.92-mm (0.31-in) MG 81 machine-gun on the right side of the nose and operated by the pilot, and two 7.92-mm (0.31in) MG 81s or one 13-mm (0.51-in) MG 131 machine-gun firing forward through the transparent nose panels, operated by the bomb aimer. The same option was available in the ventral gondola beneath the nose, firing aft, while two other MG 81s were in the rear of the cockpit canopy. Some 4,409 lb (2000 kg) of the bombload was carried beneath the wings, both inboard and outboard of the engines, while the internal bomb bay held another 1,102 lb (500 kg). 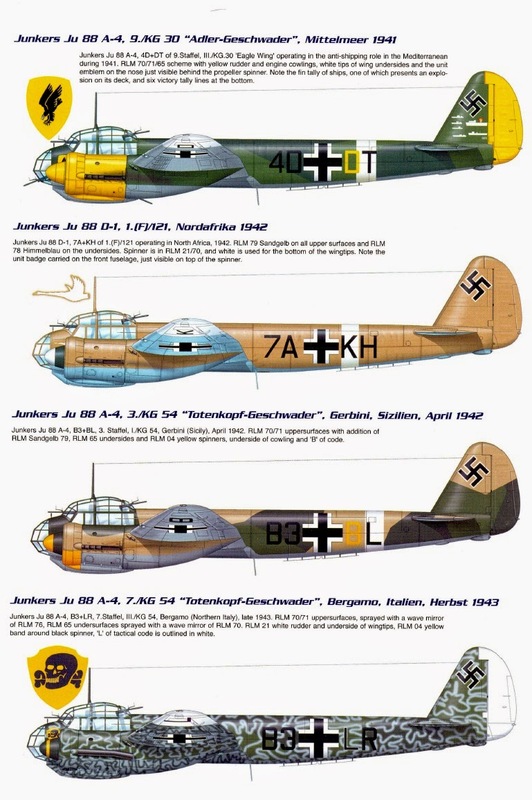 Sub-variants of the basic Ju 88A extended up to the Ju 88A-17; space considerations preclude detailed mention of all these, but the Ju 88A-12 and Ju 88A-16 were trainers; the Ju 88A-8 and Ju 88A-14 had cable cutters; the Ju 88A-11 was a tropical variant; and the Ju 88A-17 was the Ju 88A-4 adapted to carry two 1,686lb (765-kg) torpedoes. 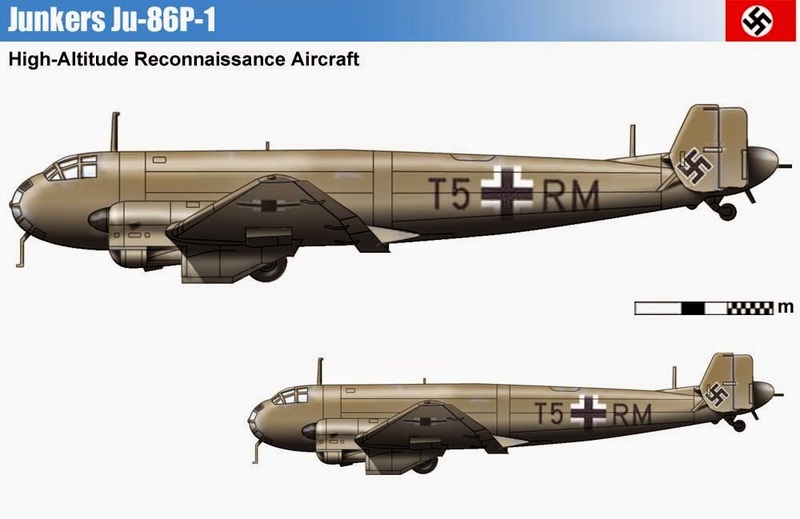 The Ju 88A-15 with enlarged bomb bay could carry 6,614 lb (3000 kg) of bombs. By the end of 1942 the Luftwaffe had taken delivery of more than 8,000 Ju 88's. 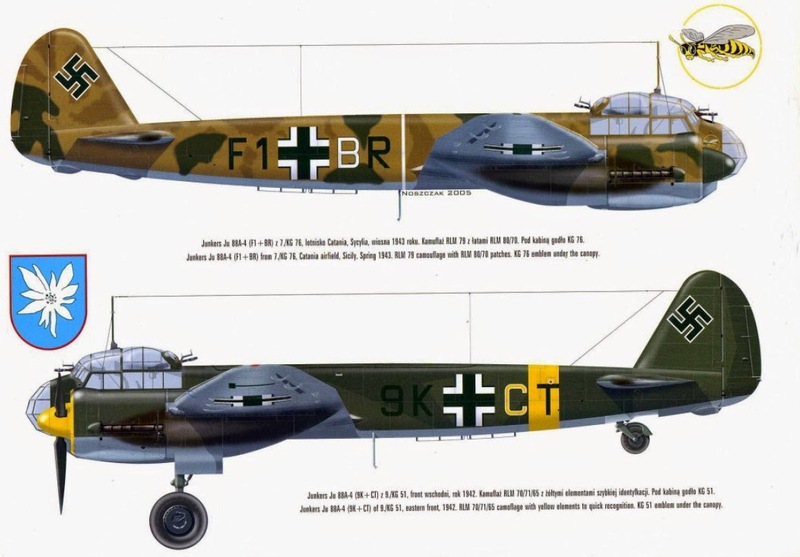 While the Ju 88A was in quantity production, Junkers was developing the Ju 88B, the prototype of which flew in 1940 with two 1,600-hp (1193-kW) BMW 80lMA radial engines. 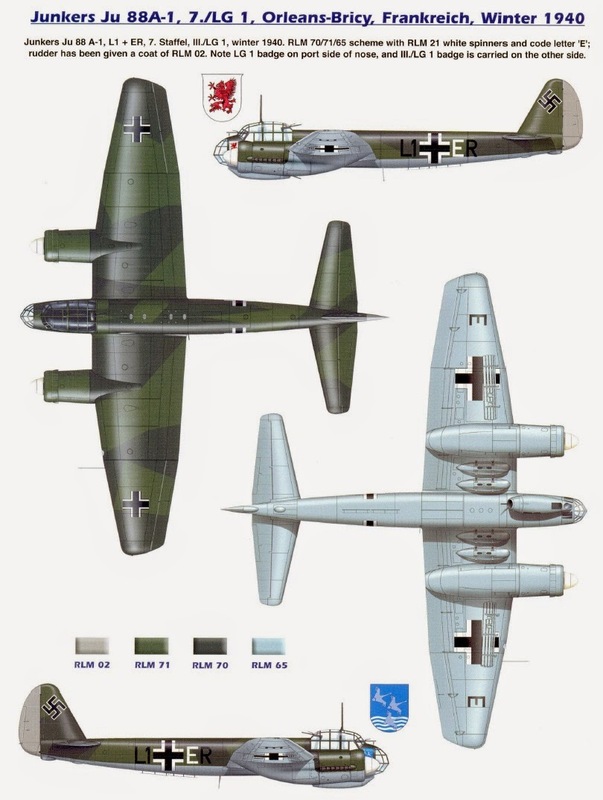 Main change in appearance was to the forward fuselage, which was enlarged and extensively glazed, and there was a marginal increase in performance over the Ju 88A, though this was not sufficient to warrant a change in the production lines, and only 10 pre-production aircraft were built. In January 1940, the Luftwaffe tested the prototype Ju 86P with a longer wingspan, pressurized cabin, Jumo 207A1 turbocharged diesel engines, and a two-man crew. The Ju 86P could fly at heights of 12,000 m (39,000 ft) and higher on occasion, where it was felt to be safe from Allied fighters. The British Westland Welkin and Soviet Yakovlev Yak-9PD were developed specifically to counter this threat. 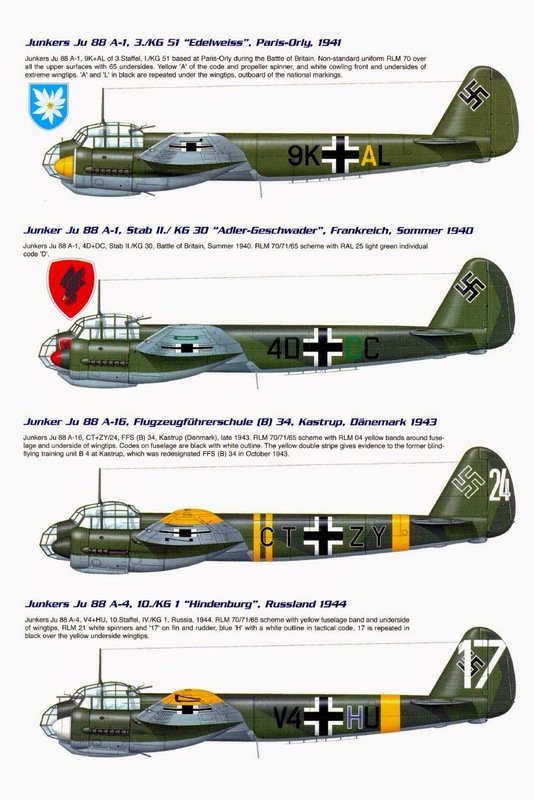 The Luftwaffe ordered that some 40 older-model bombers be converted to Ju 86P-1 high-altitude bombers and Ju 86P-2 photo reconnaissance aircraft. Those operated successfully for some years over Britain, the Soviet Union and North Africa. In August 1942, a modified Spitfire V shot one down over Egypt at some 14,500 m (49,000 ft); when two more were lost, Ju 86Ps were withdrawn from service in 1943. In 1933, in defiance of the terms of the Versailles Treaty, the new Nazi government in Germany created a foreign intelligence agency, the Abwehr, headed by Captain Conrad Patzig. He was replaced in January 1935 by Admiral Wilhelm Canaris, who developed an organization split into three Abteilung devoted to secret intelligence, sabotage, and security. Each of the three sections included air branches, designated as I Luft, II Luft, and III Luft respectively. Although run from headquarters in Berlin, Abwehr operations were dispersed to Abwehrstellen, regional centers corresponding to the German military districts, and to Kriegsorganisationen established in neutral and occupied territories, with internal structures mirroring the head office at 72 Tirpitzufer. Abteilung I Luft was responsible for preparing a prewar survey of airfields in England, and in 1935 dispatched a lawyer, Dr. Herman Goertz, to tour the country accompanied by a girl he claimed as his niece, but his indiscretion led to his arrest and imprisonment. As a result of this episode, the Abwehr was banned from conducting further similar operations and was obliged to rely on photographs taken from aircraft flown by Theodor Rowehl. Prior to the outbreak of World War II, the Luftwaffe conducted a series of aerial photographic flights across Europe in an He-111 twin-engined bomber painted in Lufthansa livery and flown by Theodor Rowehl. A reconnaissance pilot in World War I, Rowehl was renowned for having penetrated British airspace in his Rhomberg C-7. After the war, he had continued to fly a chartered aircraft until he began to supply the newly formed Abwehr with photos he had taken over Poland and East Prussia. Having begun with a single Junkers W-34 based in Kiel, Rowehl soon gathered a group of pilots around him to form an experimental high-altitude flight of five aircraft based at Staaken, but training at Lipetsk, the Luftwaffe’s secret airfield in Russia. His work impressed Herman Göring and he was transferred to the command of Otto (“Beppo”) Schmid, head of the Luftwaffe’s intelligence branch at Oranienburg, to fly specially adapted Heinkel 111s equipped with cameras designed by Carl Zeiss. 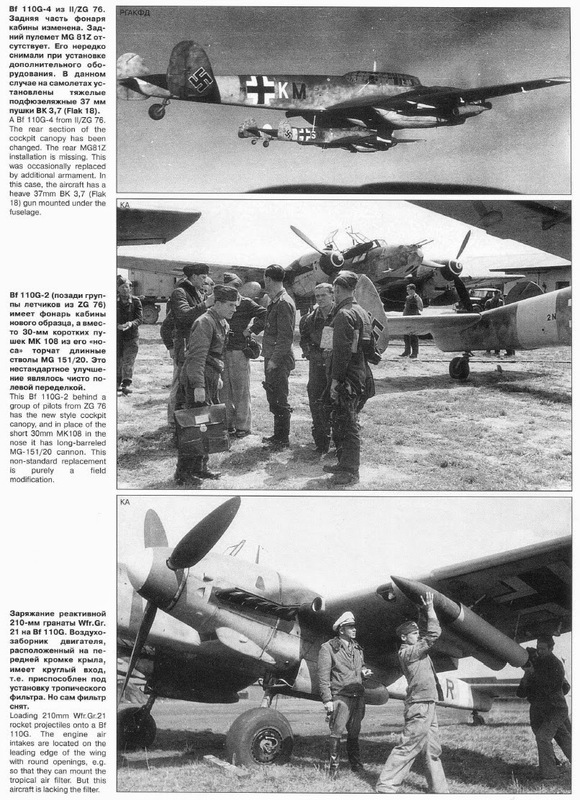 Under Rowehl’s leadership, the Luftwaffe’s air reconnaissance wing [Aufklärungsgruppe Ob.d.L.] grew from three squadrons to 53 on the outbreak of war in September 1939, amounting to 602 aircraft, by which time much of Germany’s neighboring territories had been mapped. 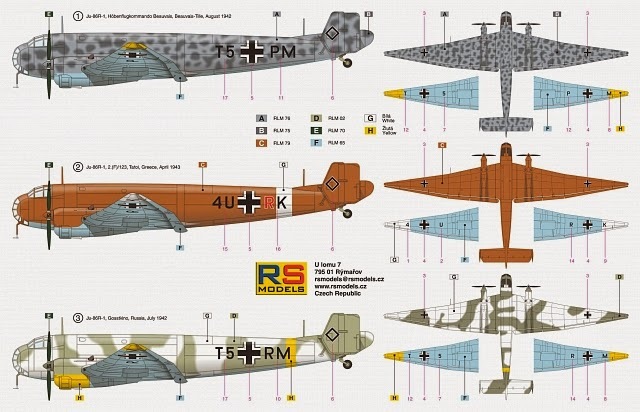 The organization was divided into 342 short-range aircraft, dedicated to tactical support, and 260 longer-range planes, mainly Junker 88Ds and Dornier 17Fs, undertaking strategic missions. In December 1943, following the death of his wife in an Allied air raid, Rowehl resigned his command. His efforts led to the creation of a unit operating for the Luftwaffe's 5th Branch (air intelligence). The new unit flew high-altitude photoreconnaissance missions over Europe, Africa, Soviet Union and this in a variety of military and even civilian aircraft. Later he would be replaced by Captain Karl Edmund Gartenfeld. Replaced is not correct as he was to form his own new group in 1942. This would lead to the creation of the famous Kampfgeschwader 200.